Digital Marketing has been the centre of attention this year, with businesses devoting more time and money than ever to their online presence. According to leading information technology research company Gartner, organisations are set to further increase their digital marketing budgets by an average of 17% in 2015. Gartner also revealed that “digital marketing was the number one-ranked CEO priority” over the next five years. Thanks to connected devices, advancements in technology, the growth of the Internet of Things and the rising number people choosing to shop and search for information online, keeping up-to-date in the digital marketing world has become more important than ever for businesses all over the world. According to the results of a survey by digital marketing experts Smart Insights in which they asked over 600 members the question “What single digital marketing technique do you think will make the biggest commercial impact for you in 2015?”, content marketing will be the most important trend in the digital marketing world next year. It will be more important than ever for digital marketers to create content which is informative and entertaining. Marketers will need to move even further away from hard selling and pitching and concentrate on providing content that customers actually want to consume. Storytelling, uniqueness, creativity and making customers thankful for content will be central to successful content marketing campaigns in 2015. In 2015, sites that are not optimised for mobile devices will start to fail. As Google is starting to place more and more importance on mobile usability, and has been penalising sites that generate errors for mobile users for over a year, it has become vital for companies to have fully responsive websites. Not doing so could see them losing out on search engine rankings, traffic and conversions. The struggle to integrate SEO, social media, advertising, content and online PR strategies will be as prominent as ever in 2015. There will be a conscious effort to integrate digital marketing strategies, as well as non-digital, across all platforms, which would see companies getting closer to delivering one experience to customers, no matter where they are in their customer journey. Internal business affairs are becoming more and more important for consumers, who want to be able to know what’s happening inside companies that they buy from at any given time. It is becoming increasingly important for consumers to be able to buy from companies that they can relate to and with which they share moral values. It will become more important to portray this through digital marketing strategies, to give companies and brands a voice and be consistently open and honest with customers to earn trust and loyalty. In 2015 it will be the digital marketers with the best digital acumen and skills who are the most successful, it is expected. Not only will they need to be influential writers, they will need to know coding. According to Jason Miller, Senior Manager of Content Marketing and Marketing Solutions at LinkedIn, “Coding will become a necessity for digital marketers. The ability to understand how front end web development and coding can affect, enhance, and optimize a content strategy will become a necessity for marketers instead of a nice to have.” Being able to use technical skills to fully enhance digital marketing strategies will be essential in 2015. Mass marketing is out. In 2015, more emphasis will be placed on delivering an online customer experience that is personal, relevant and convenient. Advances in technology mean that services like dynamic insertion, customisation or suggestions of relevant content are available to make it easier than ever to provide a personalised digital experience to customers. Next year will see an increased use of algorithms to hyper-personalise adverts and there will be more of a focus on the customer journey and the consumer as an individual human being. 2014 was a huge year for video, with the use of video content for marketing increasing by a huge 73%, and is predicted to grow even more in 2015. According to research by social media education company Social Fresh, videos on landing pages increase conversions by 86% – giving marketers more incentive than ever to produce informative and entertaining original video content. 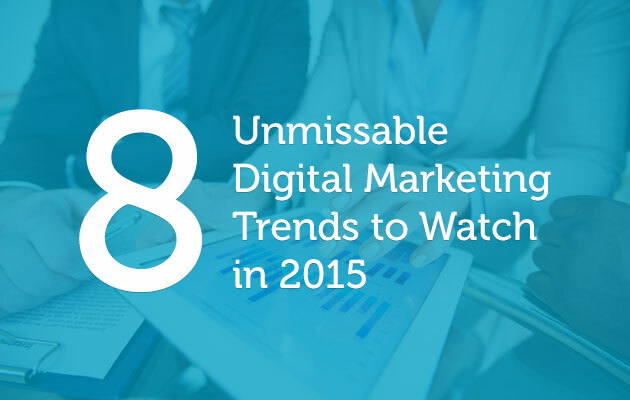 In 2015, digital marketing campaigns will be monitored, analysed and evaluated more closely than ever. Data-driven marketing will become more prominent, with marketers intently measuring campaign performances and driving measurable results using highly accurate tracking and analytics tools. It will be more important than ever for digital marketers to understand and interpret their analytics reports and to use this information to more efficiently target customers and drive sales. Accurate and easy-to-use resources such as Google Analytics and Kissmetrics are continually improving to enable marketers to closely monitor sites and campaigns and gain an even deeper understanding of the online consumer to that in 2014. If you need any help with your website or your digital marketing strategy for 2015, why not get in touch today?